BOGOTA — UNFPA Executive Director Dr. Babatunde Osotimehin visited Colombia, for the first time, to review the country’s progress in reducing maternal deaths and teen pregnancy, two of the indicators for the Millennium Development Goal on improving maternal health. Day One: Dr. Osotimehin began his visit touring two health centres in Bogota, where UNFPA has been supporting the work of the city’s Health Secretariat. In Bosa, one of Bogota’s most populous neighbourhoods— with one of the highest rates of teen pregnancy in the city — the Executive Director spoke with young people and health officials about their expectations and needs. They met at a ‘youth corner’, a youth-friendly centre aimed at addressing the sexual and reproductive health needs of adolescents in a sensitive way. One out in five adolescents aged 15 to 19 in Colombia have been pregnant, which is high even in a region where teen pregnancy is considered an obstacle to development. MDG 5 calls for a reducing that rate to 15 per cent by 2015. At 73 deaths per 100,000 live births, Colombia’s maternal death rate is also relatively high for a middle-income country. The MDG target is to reduce that number to 45 deaths per 100,000 live births by 2015 — a huge challenge for Colombian society as a whole. 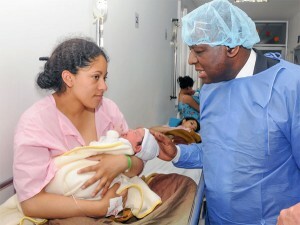 Dr. Osotimehin also visited Kennedy Hospital in Bogota, which has piloted a new model of surveillance of maternal morbidity. With this model, initiated by the Ministry of Health with the support of UNFPA, Kennedy Hospital has managed to reduce deaths to 1 per cent of women with complicated deliveries. All of the health districts in the country have now been trained in the implementation of this model. The Executive Director, who is himself a medical doctor, welcomed the appropiate aproach of the model, which incorporates gender equity, women’s human rights, and effective access to sexual and reproductive health services. These progress and lessons learned will now be shared with other countries in Latin America and the Caribbean, through a Regional Platform for South-South Cooperation. 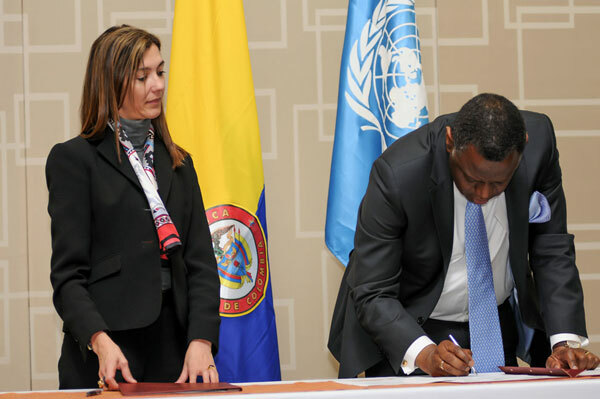 This process was formalized with the signing of an agreement between UNFPA and the Presidential Agency for the Cooperation of Colombia, which the Executive Director witnessed. Sandra Bessudo, APC’s General Director, described it as “an strategic and important” agreement, which will foster ties between countries on issues such as teen pregnancy, maternal mortality and development planning, among other issues within UNFPA’s mandate. 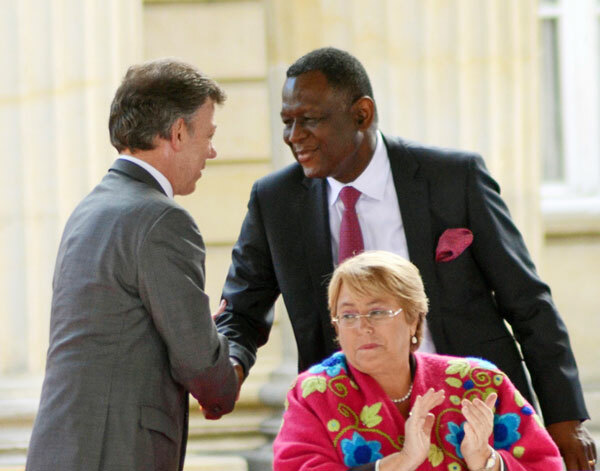 Day Two: Dr. Osotimehin had a joint agenda with UN Women Executive Director Dr. Michelle Bachelet. Both agencies address challenges related to protecting women’s rights in Colombia and worldwide. The two Executive Directors met President Juan Manuel Santos, the Minister of Foreign Affairs, and Cabinet Members, including the Minister of Health, the Minister of Justice, and director of the youth presidential programme, Colombia Joven [Colombian Youth]. In those meetings, Dr. Osotimehin called attention to the “importance of incorporating, in all governmental programmes, a special emphasis on developing young women’s capacities to make their own decisions about their lives and their reproductive rights.” He referred to adolescent pregnancy as a “violation of young people’s rights to opportunities”. Additionally, Dr. Osotimehin attended the launch of the national public policy on gender equality for women. The new policy is being promoted by the Presidential Office for Gender Equality, which has been supported by UNFPA, UN Women and other United Nations agencies.